We are a bunch of like minded people who get a bit of a buzz out of making plastic models. Some build models straight from the box - or plastic bag, while others like to scratch build and put in lots of details. To give you some idea of the range of models, have a look at our members' biographies and our galleries. We all enjoy the hobby and everyone is happy to talk about their models, or ask for help, swap techniques, or offer encouragement. 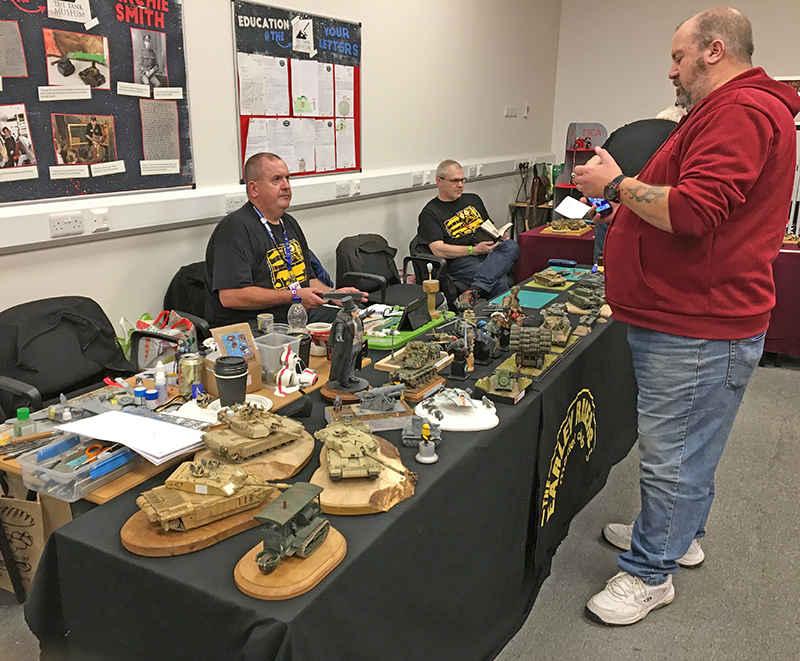 The Earley Risers Model Club is a branch of the IPMS(UK) as such most, although not all, of our members have IPMS membership. 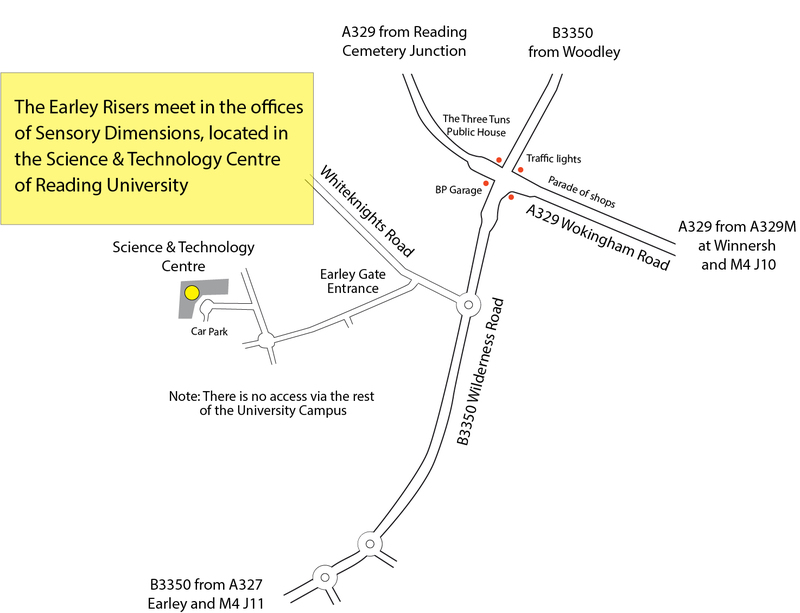 The club meets in Earley, on the Southwest side of Reading, usually on the third Sunday of each month. Some members turn up for a full day's modelling (10:00 - 17:00), while others come along anytime during the day, just for a chat. Please contact Steve Abbey, or come and see us at any of the model shows we'll be attending during the year. The Earley Risers have moved! at the new offices of Sensory Dimensions. 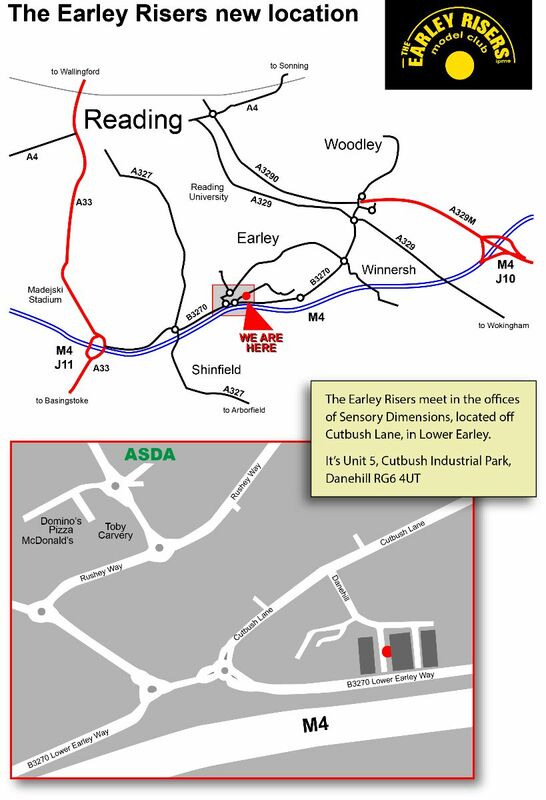 (between Junctions 10 & 11). The show seemed quieter than in previous years. As per usual, The Earley Risers did well at the competition tables, with Hugh, Mick and Steve coming away with awards for ALL their entries! 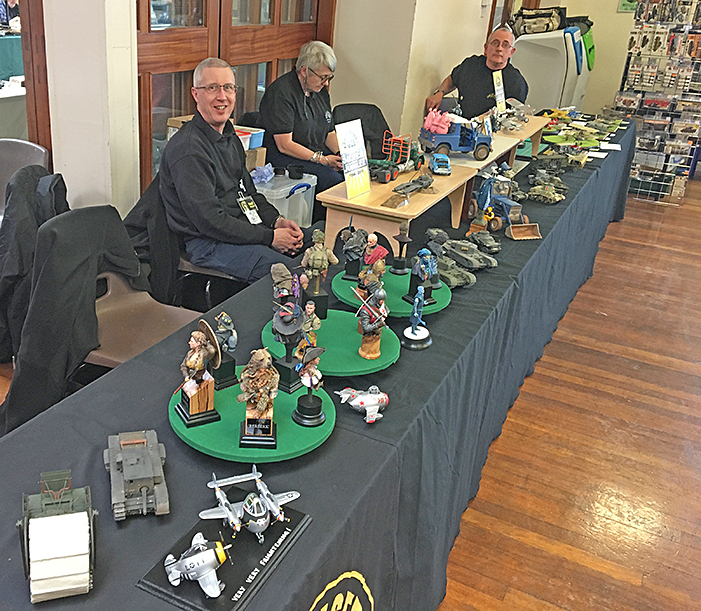 ERs maiden visit to Yeovil Model Show. Liz & Steve stayed nearby in overnight accommodation and got to the venue when it opened. Geoff and Big Mick got up really early and travelled down on the day. While Roly, who ended up taking a roundabout route, got there a little later! The show was spread accross several big halls, within the large academy and leisure centre complex. This was only the second model show held at this delightful place. 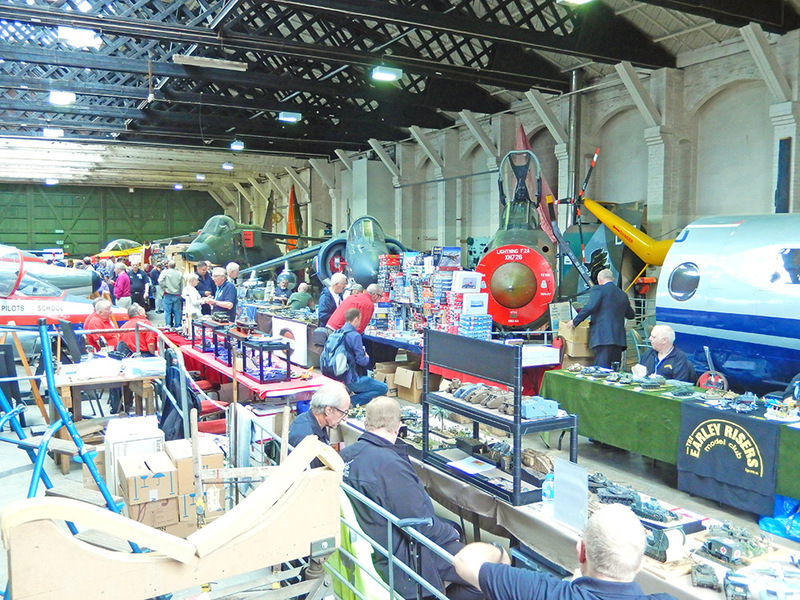 The uneventful journey home ended a very enjoyable day out, with another great venue to add to our list of model shows to visit. Looking forward to next year's event! Jeff and Steve set up the tables and cloths on Friday, the day before the 2 day show. Saturday morning saw Jeff, Liz and Steve arrived first, soon joined by Big Mick, along with Martin and Carol. Rolly completed the set up. Jeff and Mick returned on Sunday, joined by Geoff. The stand attracted a lot of attention - yet again! 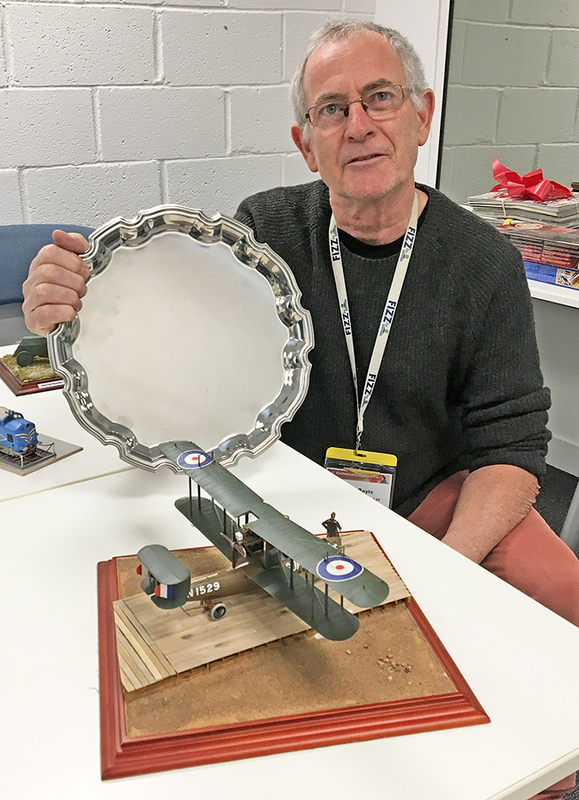 Hugh beat off some stiff competition, with his scratch-built Supermarine flying boat, to be awarded the Christmas Plate, which is judged by George each year. The Christmas Raffle raised £55 to go towards club funds. Models were collected for Tim to deliver to Models for Heroes charity. Attendees brought a large amount of seasonal fayre, which was heartily appreciated (and comsumed) by all. Season's greetings to you all. and your sprues not wilt or perish! The 2018 season ends at BMSS Bugle Call. 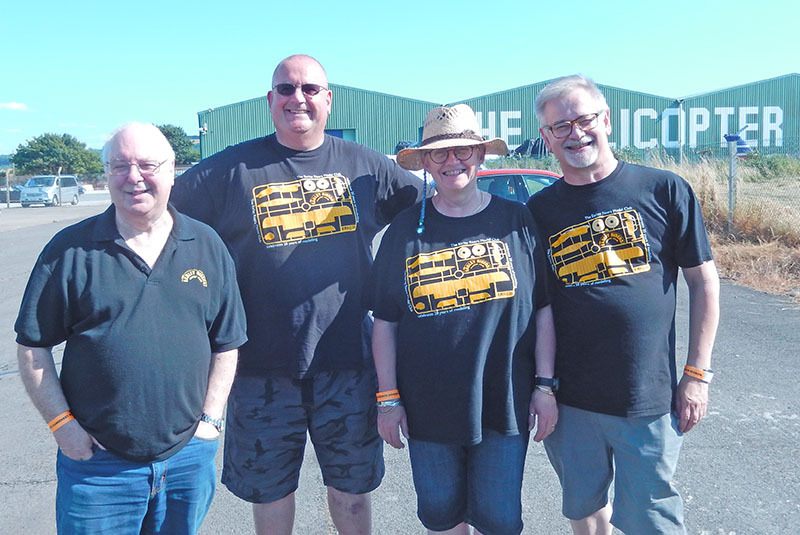 Liz, Mick, Tim and Steve ended the 2018 season at the BMSS show, held at Nailsea School in Somerset. It was a first visit by Tim, who seemed to enjoy the experience. 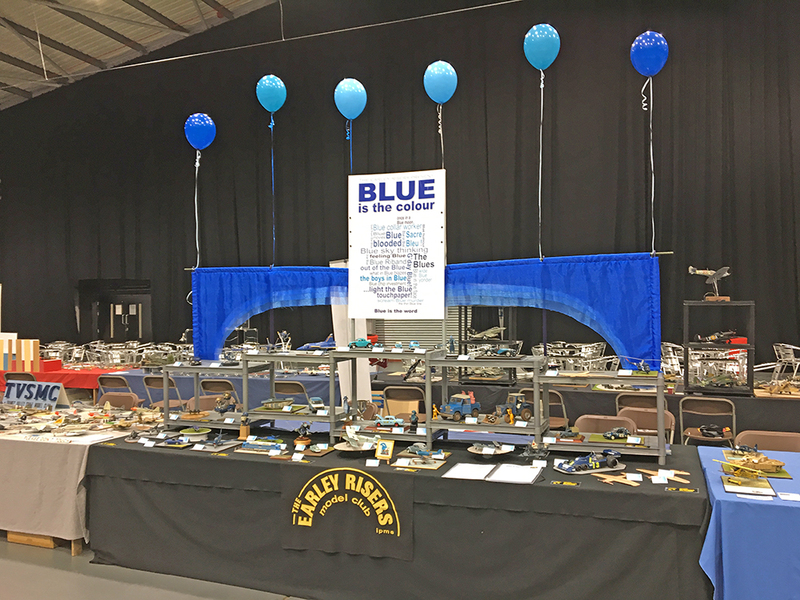 Blue is the Colour at SMW2018 in Telford. The stand was quickly put up and populated with our models (which included models by those who couldn't make it to the show on Friday; George, Tref, Peter and Les V.) -- although Steve only remembered the balloons after the halls were vacated in the evening! 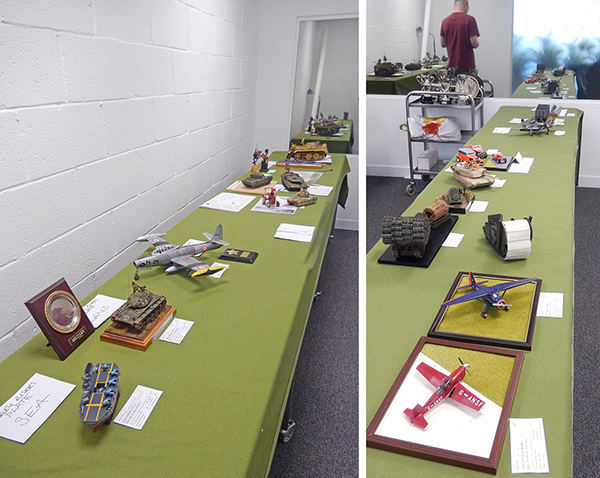 Tim arrived on Saturday morning with his models, a couple of which were finished by lunchtime! 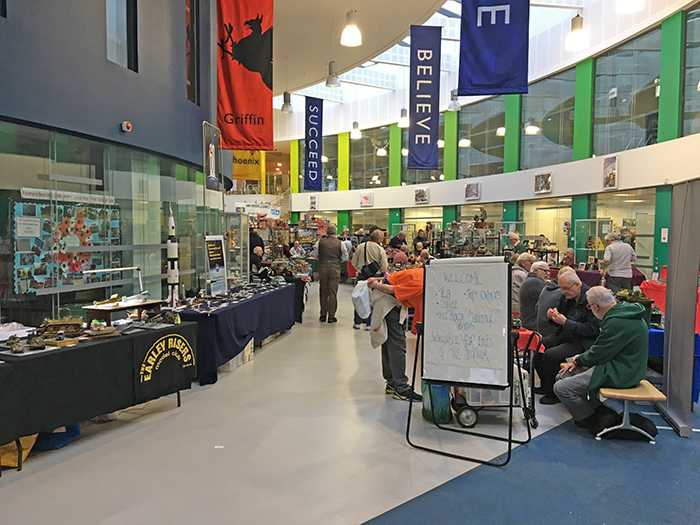 On another cold and wet October Friday, Jeff and Steve found some tables and once again set up the display in the relatively warm Education Centre at The Tank Museum, Bovington. Early Saturday morning saw Liz, Jeff & Steve, closely followed by Big Mick, Sean and Geoff quickly set up the stand. The arrival of Tim completed the line up. The stand once again attracted what seemed like a constant stream of interested parties asking all sorts of questions from the ERs behind the stand. 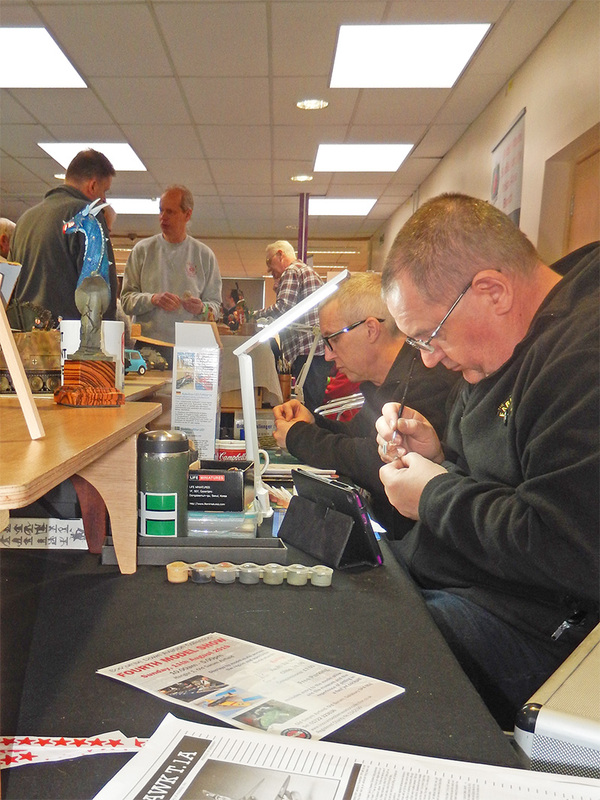 Unfortunately, only Jeff was able to man the stand on Sunday, where he did a sterling service on his own! 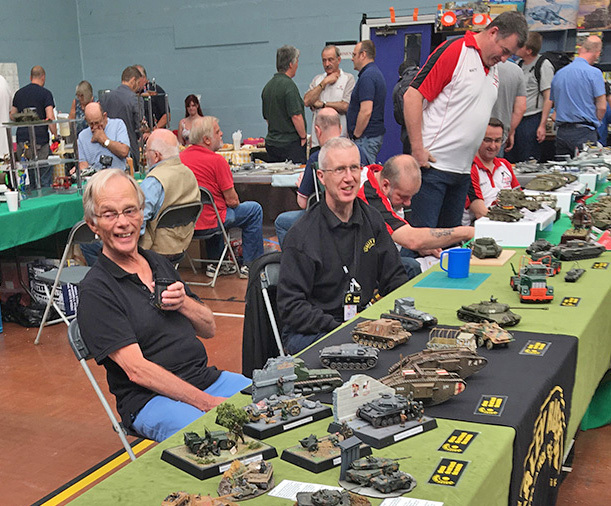 The Earley Risers had a great day on the competition tables at IPMS Abingdon's show. Phil May, Steve, Hugh and Les Vowles all came away with certificates this year. Farnborough's show proved popular with ERs and public alike. Jeff and Big Mick arrived first, closely followed by Liz & Steve. Mark and Les V soon joined us, along with Geoff. Both Roger and Peter called in to see us - and the rest of the show! Big Mick won a large number of kits on the tombola - as usual! 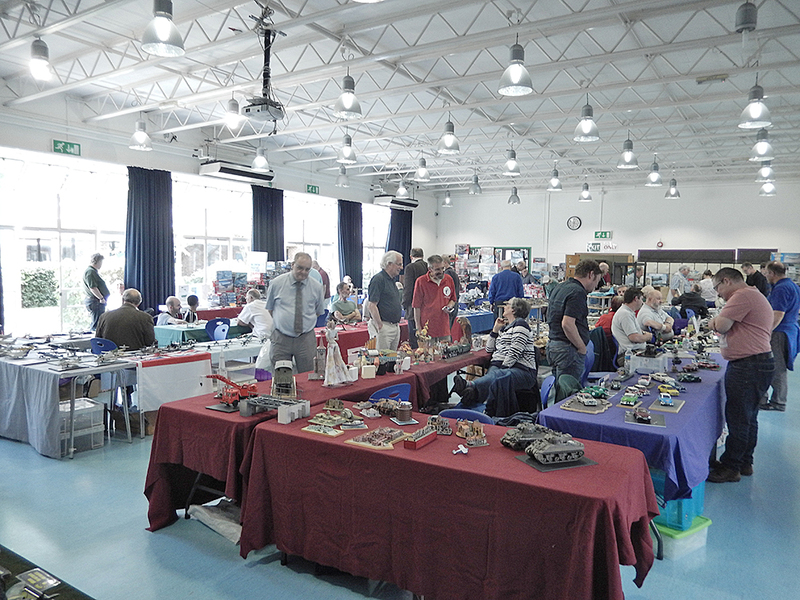 The brightening weather made the show a great success, bringing with it visitors who, at times, packed the main halls. Liz, Steve and Jeff enjoyed a busy day at Old Sarum airfield. Liz and Steve set up the stand and were soon joined by Jeff, Mark & Jeff. Rolly completed the attendance. By lunchtime, most participants, both attendees and visitors alike, were wilting in the heat. 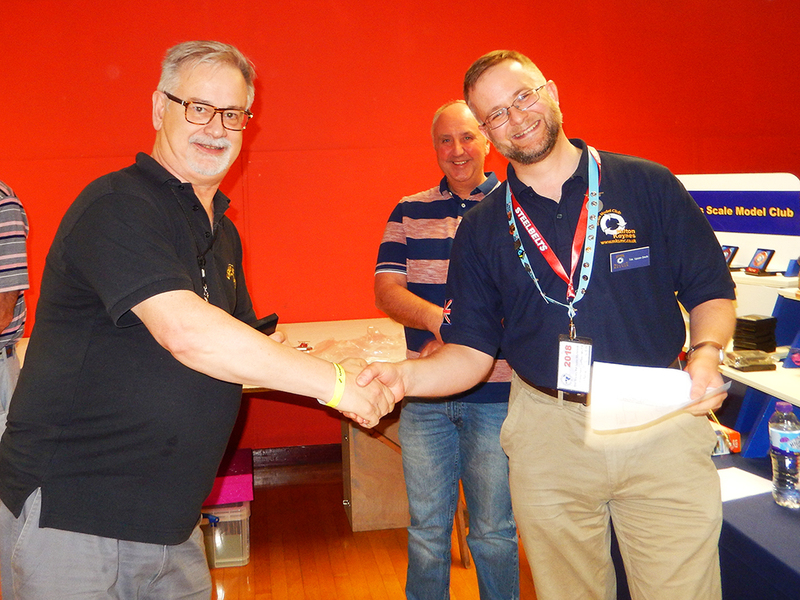 Steve's models picked up a couple of awards on the competition tables. held at the delightful Helicopter Museum. Situated just down the road from the former RAF Locking, the show was easy to get to, via the M4 and M5. 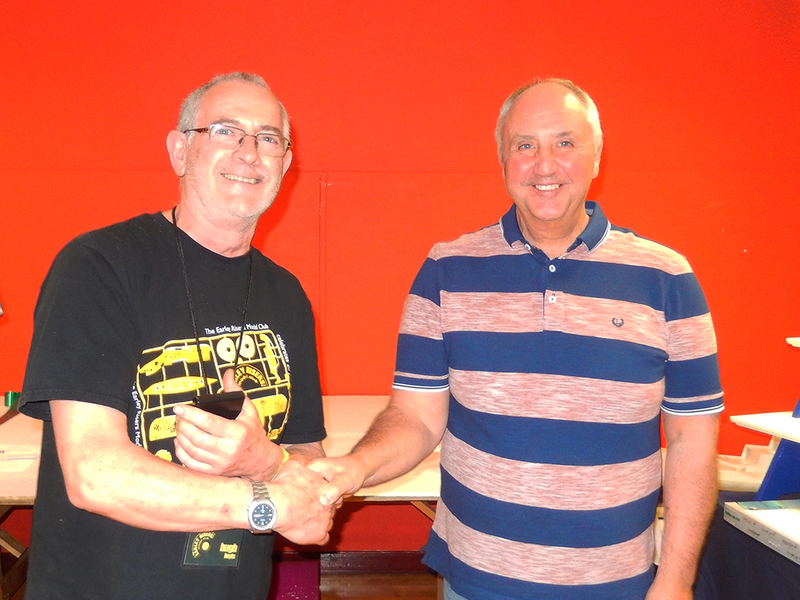 Held for the first time at our new location and run by Sean, our new competitions officer, the summer competitions were a great success. Attended by the majority of The Earley Risers members, judging became quite hectic. A tight squeeze at Churchdown. Although in the same place as last year, The Earley Risers' stand was reduced to just two tables and was squeezed into the corner. After laying out a few models each, Liz & Steve, Jeff, Hugh and Sean, closely followed by Roly just about managed to shoehorn themselves behind the stand. Access was at a premium as everyone from our stand - and those on the stand next door - had to move out of the way to enable us to get out! After a word to the organisers, we have been promised a different stand location next year - fingers crossed! The heat was on at ModelKraft! 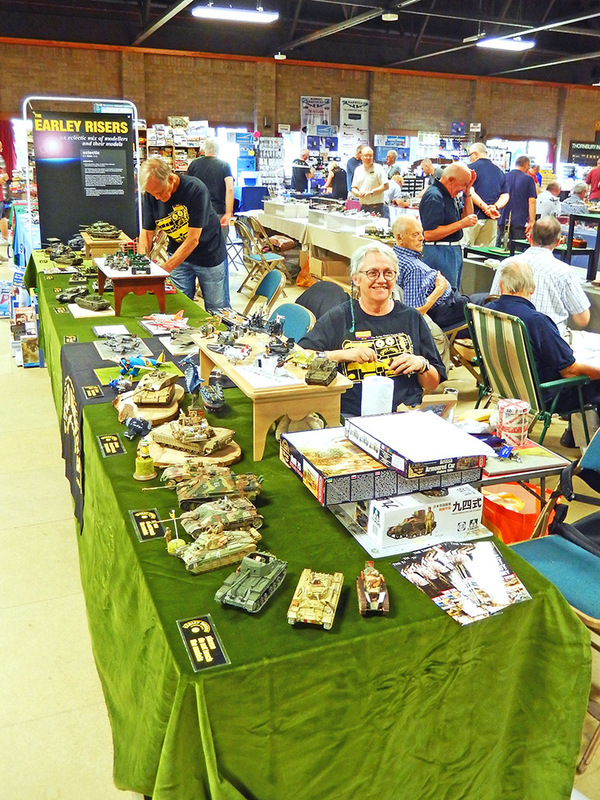 It was a hot day in Milton Keynes as Mark, Hugh and Steve set up the Earley Risers stand at IPMS Milton Keynes' show in the Stantonbury Leisure Centre. As temperatures soared outside, both modellers and visitors sweltered inside the venue.